Home Sweet Home: Mini Pumpkins--All 635 of Them! Joan's Farm in Livermore sold me 635 mini pumpkins, so I could deliver them to my Livermore neighborhoods around me reminding people who I am and what I do. The Livermore minis were inspected, washed and scrubbed (some of them) then set on a cart for delivery. Ergonomic and motion study experts would have tipped their hat I think when they saw how I braced the pumpkin tub onto my cart to raise the level of pumpkins so as not to force me to bend into a tub over 600 times. Putting a 40 count cluster of minis onto the removable lid allowed even better reach and left a huge reservoir of pumpkins underneath to help me restock the lid whenever I had to deliver 200 or so mini pumpkins in one trip. My routes are all carefully mapped as well so as not to double back or deliver both sides of the street. My 15 years as a UPS driver in Fremont helped with that. I covered all the girl streets in Livermore within the boundaries of Charlotte, Joyce, Bianca and Katrina. 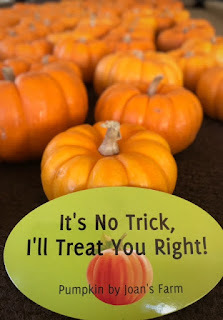 So, if you live on Debra, Felicia, Hazel, Carla and the others, you would have by now received a mini pumpkin with my card that says, "It's No Trick, I'll Treat You Right!" Some of my other ideas were delivering a mini bottle of Tabasco sauce reminding people that the market was hot. I delivered house-shaped sponges early spring (Spring Cleaning), I hand delivered 635 tomato plants in late spring, and I delivered bay leaves in the winter for cooking stew, etc. My main job I am responsible for as a Livermore-real-estate-agent http://www.tricityhome.com is to find buyers for sellers and sellers for buyers, then a myriad of other things once a real estate purchase contract is signed. I also manage properties in Livermore and other areas. Wrapping it up, be creative when it comes to reaching out to the public. Dropping off a xerox copy of homes that sold in Livermore is not creative. Make it interesting, and make it fun. They'll remember you.